Close to the village Riza of the prefecture of Preveza on a natural fortress, is saved the famous castle of Riniasa that protected the medieval homonymous cittadel. During the Middle Age was developed in the castle a whole state. The castle was probably built by the Despot of Epirus, Thomas I in the end of the 13th century for the protection of Epirus, that is why it was called Thomokastro. In 1338 during the revolution against the Byzantine Empire, Nikiforos, γthe son of the last Despot of Epirus, Orsinis, administrated the castle. 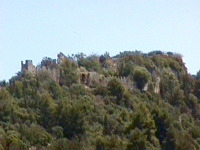 Ioannis Kantakouzinos after the conquest of the castle of Arta and the castle of Rogoi, convinced Nikiforos to give in the castle. The Byzantines preserved until 1350 when it was conquered by the Serbians and after by the Albanians, who named it Riniasa. Later, bacame many attempts for its fortressing and was the centre during the war of Souliotes against Ali Passia.